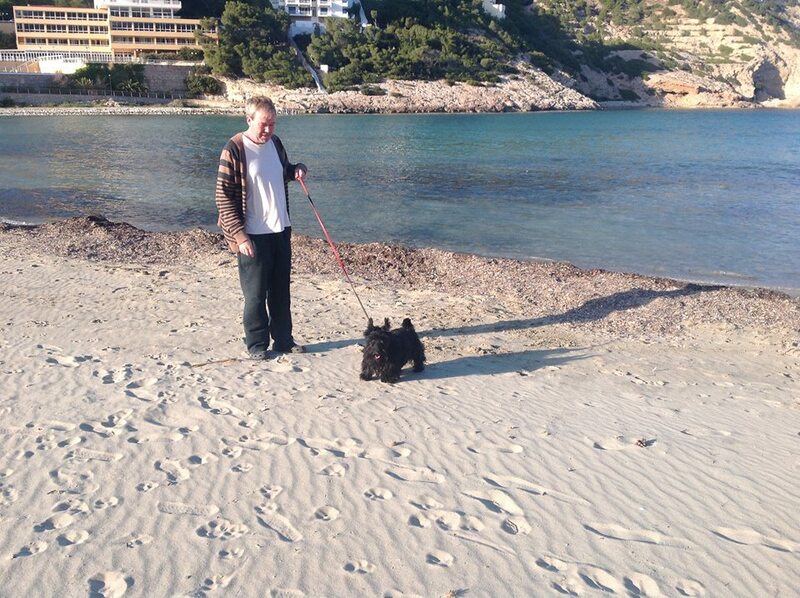 Here’s a pic of Dougal at his summer residence! This is one lucky little Scottie. He was found straying and taken to the local vet in Ireland. We were contacted to take him but a few minutes later we were told he was going to be put to sleep as he was too aggressive. We told the vet that we would still take Dougal and give him a chance. We had Dougal here for a month and nicknamed him The Growle…r, but whilst he did growl he never snapped and after a month you could lift him up and give him a kiss. He went to a lovely home spending 6 month’s in Derbyshire and 6 month’s in Ibiza where he has just arrived. Sometimes all they need to be given is a chance. Dougal is only about 18 month’s old and now has a long and happy life ahead of him. Excellent. Well done.Thank goodness for STECS.